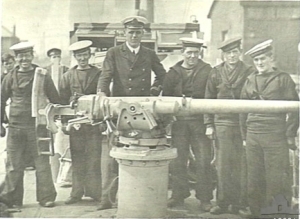 The 3pdr Hotchkiss gun was a very old design originally developed in 1886 to deal with torpedo boats wherever 6pdr mountings were too heavy. The original mounts could elevate to only 25 degrees and the published range tables were good to only 6500 yards, although most mounts were converted to give a maximum elevation of 50 degrees. The only ships in the Pacific larger than yard craft that carried this weapon were the Grimsby-class sloops.